Fresh off the accolades for last year’s tax cuts, the Trump administration is mulling another one. This time the target is the capital gains tax, which the administration may try to reduce without approval from Congress by changing the definition of investment profits to take inflation into account. The capital gains tax applies to profits from long-term investments. If you buy a stock for $ 10 and sell it for $ 110, for instance, you would owe capital gains tax on the $ 100 in profit. The rate depends on how much non-investment income you earn that year. Individuals at the lower end of the income scale do not have to pay any capital gains tax, while those in the middle pay 15 percent and high earners pay 20 percent. Under the policy the Trump administration is considering, the gain would be adjusted for inflation, so investors would pay taxes only on the real profit they earn. Treasury Secretary Steven Mnuchin told an interviewer at the Group of 20 summit last month in Argentina that his department might be able to make this change through regulation. “If it can’t get done through a legislation process,” Mnuchin told The New York Times, “we will look at what tools at Treasury we have to do it on our own, and we’ll consider that.” Lawrence Kudlow, director of the National Economic Council, also supports the idea. While indexing capital gains to inflation could promote economic growth, it’s not such a good idea for the president to impose the policy unilaterally. When conservatives tried that under President George H.W. Bush in 1992, National Review‘s Ramesh Ponnuru notes in a Bloomberg Opinion column, they met with strong resistance from the Treasury and Justice departments. 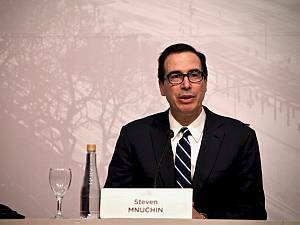 Even if President Donald Trump has the Treasury Department on his side this time around, enacting a major tax change without congressional approval would invite legal challenges. Another issue is the tax cut’s fiscal impact. Last year’s tax cuts are projected to add $ 1.5 trillion to the deficit during the next 10 years, and that’s assuming Congress lets the cuts expire in 2025, which it is unlikely to do. Ricco estimates that indexing the capital gains tax to inflation would cost the government an additional $ 102 billion in revenue during the same period. That’s a small hit compared to last year’s tax cuts, but every reduction in revenue that’s not offset with cuts in spending will make the current fiscal hole that much deeper. Instead of shrinking government, Republicans are passing the burden on to future taxpayers, a dangerous and reckless policy.